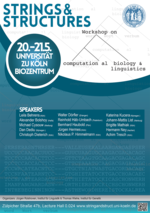 Aim of this workshop is to bring together scientists from the fields of computational linguistics and computational biology and to discuss potential overlaps in their respective research problems and in the means to address them. With the recent developments in large scale computing - "big data" - in data driven and algorithmic research in both linguistics and biology, it is timely to re-address long standing questions on the computability of meaning and function and to tap potential synergies between the two fields. 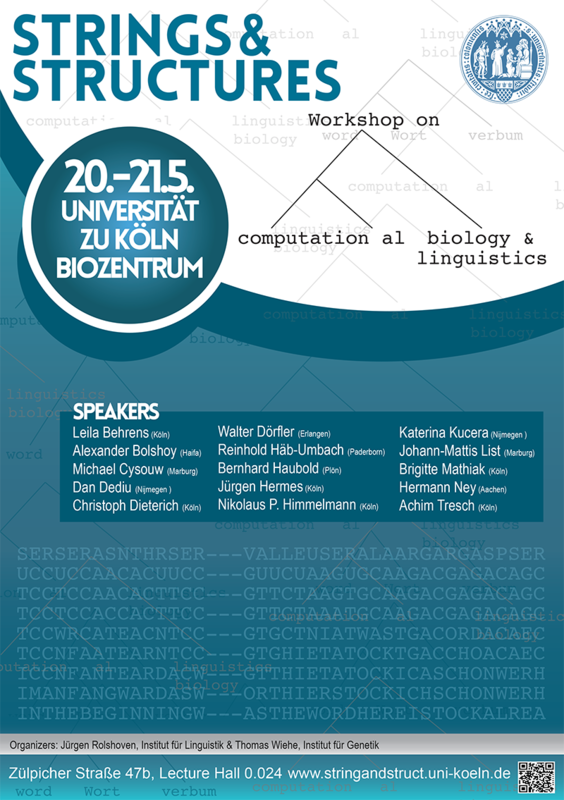 The University of Cologne Forum is funding the project "Strings & Structures: Codes of Sense and Function in Genomics and Linguistics". One of the central aspects of this project is the communication and generation of networks between experts of both fields. The above workshop is intended to be the first in a series and hosts national and international speakers. It is a two half days workshop and takes place at the Biocenter of the University of Cologne from May 20th (14.00) to May 21st (13.00). All interested scientists are welcome to attend. Please register - free of charge - through this website.